The Haskell Craft Club started March 17, 1982, as a social activity for the Senior Citizens of Haskell. At that time, all manner of crafts were enjoyed. But over a period of years, it became centered on quilts and quilt making. In the years since that time, quilts have been stitched for the public, and for Club members. With donated material, “Tied” quilts are made. These quilts are sold, but they are also given to people in need, for instance, people who have lost belongings due to fire or storms. Lap robes have been made and donated to Nursing Homes, and hospital type gowns made and donated to Hospice. 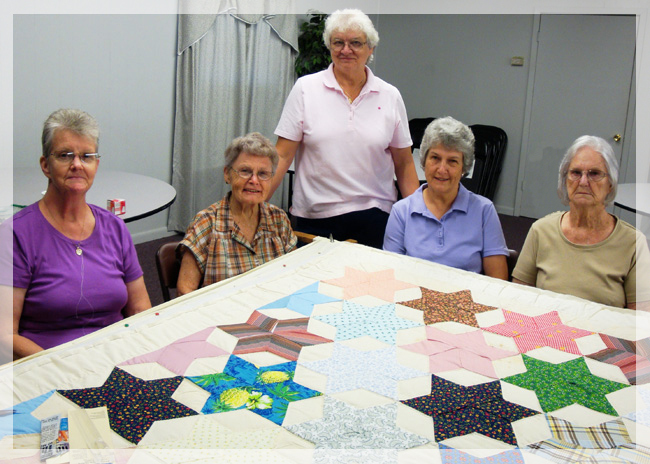 The Club meets every Friday morning from 8:30 – 11:30, for Quilting, Fellowship, and a Pot-luck Lunch, at the Haskell Community Center on East Elm Street. Anyone interested may contact Haskell City Hall at 501. 776.2666.